Jungle Red Writers: What's for Breakfast? HANK PHILLIPPI RYAN: What a week this is turning out to be! I say—let’s take a lunch break. Or—depending one where you are, breakfast. How much do you love breakfast in diners? One little word: bacon. And okay, hash browns. And coffee. Why does it somehow taste better in a diner? GEOFFREY MEHL: Tommy, who is a southern rascal with a ton of money and Mandy is a classy New Englander who knows how to use it. He's addicted to adventure and troubleshooting, while she's passionate about social justice for the underdog. Their crew includes a discarded Russian badass spy, a brilliant and smartass computer hacker and a growly retired US Marshal -- i.e., a classic five-man band. High stakes, high style ... and sizzle. Tales of the Puffin Diner is updated weekly -- the current one concerns new year's resolutions, which Mandy thinks are silly and Tommy manages to prove a larger point. Next story concerns a landmark barn that's being sold and distresses the old timers, that is, the melancholy that comes with change. the social hub of a small town and serves up marvelous daily specials. and not many people do — The Puffin is just another small-town diner. and then on to where ever your fortunes take you. Outside, there always a place to park and unhurried life flows by. toothpicks, and a few candy bars below. The point of sale for a benefit cook book and local handmade soap. Specials of the day in colored chalk on an antique blackboard. Gently-lettered notes to identify pies, cakes, specialty desserts. Menus wrapped in plain-brown vinyl. A row of black and white snapshots from memorable moments in The Puffin’s history. A framed dollar bill from 1949. But no wi-fi, and cellphone reception is chancy. Adele Guthrie, from the collection of the Jacks Ford Historical Society. had breakfast and fanned out for another routine day in a rural town. You’ll miss out on the business and political pulse, like the latest scheme to oust Bob Ferguson from another term as mayor. society’s annual fund raiser, or whether the Brewer kids really need yet another dog. HANK: So, Reds, what’s your favorite diner... and the menu special that keeps bringing you back? And see below—Geoffrey also is a gardening expert! drafts in the third booth from the end. Mandy Owens appears as herself in two books by Geoffrey Mehl : Stray Cats and Nine Lives, and is currently working in a new thriller, to be released soon. When not involved in high-stakes adventure, she divides her time between Jacks Ford and a hideaway in the Bahamas. C.J.s in Belltown in Seattle. French toast and bacon (and lots of maple syrup for both)! Now I'm hungry! Okay, I’d really like to have a meal at The Puffin . . . .
Alas, most of the diners around here have gone the way of the dodo and the passenger pigeon . . . . There was a wonderful diner, almost exactly like The Puffin, where my mom and I especially enjoyed breakfast. They served scrapple, which she loved with eggs over easy; for me it was always soft-scrambled eggs with cheese, bacon, home fries and an English muffin. And coffee. Why is it that diners always have the best coffee around? In Auburndske The next town over, is a place called The Knotty. Pine--we go there all the time! For fabulous scrambled egg whites, and bacon, and delicious toast. It has red vinyl books, and a formica bar. And little aluminum napkin holders. Sometimes I get omelettes with mushrooms and tomatoes and cheese and bacon, and a side of bacon! Jonathan always gets the short stack. I have never tasted maple syrup :-). Welcome Geoffrey! The Agawam Diner on Route 1 in Rowley, MA, is a classic. I haven't been in years. But my idea of perfection is really crispy hash browns, a perfect egg over easy that the hash browns can sop up, and bacon. Delight. For another fictional breakfast place, head over to Robbie Jordan's Pans 'N Pancakes in South Lick, Indiana (right, Hank?). You'll get all the local gossip and a touch of murder, too. Maybe Robbie needs to take a research trip to the Puffin! I agree with Joan...several classic diners have closed both in Ottawa and Toronto in the past 1-2 years, so finding that perfect morning indulgence is harder to find. A really good omelette with hash browns, or a corned beef hash would be my go-to diner dishes! 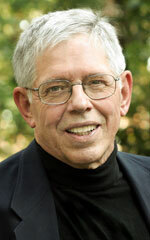 Hey, gang, head over to Geoffrey's FB author page and give him some Like love! I would love to know about your writing routines. All of you! Love this description, Geoffrey, and welcome to Jungle Reds! Best diner award from me goes to the 4 Aces in W. Lebanon NH just about at the Vermont border... go for the perfect original Decco diner decor (red vinyl, chrome...) stay for the homemade corned beef hash and fresh squeezed OJ. Being a person who usually has only a bagel with cream cheese for breakfast, I adore breakfast in a diner. My favorite local diner is Pamela's (they have several Pittsburgh locations, I'm partial to the one in Shadyside). Hotcakes with crispy edges, butter, and syrup. Scrambled eggs. Crispy bacon. Home fries that are crisp outside. And a slice of rye bread toast. When I was in college, we'd occasionally take a trip to a place called Earl's, a diner up Route 16 in the middle of nowhere New York. Diner food to die for. They are sadly closed now. Hank, you've never tasted syrup? Love diners, and when I was a senior in high school in Hamilton, Ohio, I waitressed at the famous Hyde's Diner. It's still there, serving fabulous fried chicken, breakfast all day, and delectable homemade pies. My mother and I had lunch there on Monday. We had double cheeseburgers and the best onion rings in the world. The menu now includes the history of the diner, some of which I didn't know. Hub Hyde and his brother Jim, home from WWII, opened what was then an ice cream stand in 1946. Eventually it expanded, and it's still in the same spot today. I marveled at how little it's changed since 1968, when I hustled around to my booths holding six plates along my then-skinny arms. Today, the third generation of Hydes, granddaughters to the original owners, run and manage it. One waitress who was there in 1968 still works there, too! Anyway, Geoffrey, so great to welcome you here! Tell us a bit about your books! And your writing,and your self! >>And why is it that fancy restaurants of ten have a brief lifespan---but diners survive? Is it just the irresistibility of grease and bacon? And just click on Geoffrey's name to go to his facebook! Oh how fun this piece is - and what a wonderful watercolor! Diners don't seem to be plentiful, or as important, in the south as I remember them being up north. Or maybe I just haven't been paying attention. There is a diner kind of place here in Boone, but it's not the real thing. 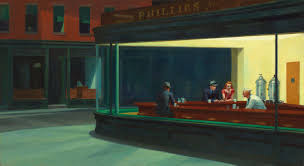 What I always loved best about any diner was the people watching. And breakfast, of course, if I can order breakfast at any time during the day or night I am a happy girl. Not many diners here, but there was one in Fort Lauderdale I frequented. Lester's. Amazing. Still has jukeboxes at the tables - - well did last time I was there. Huge cups of coffee, revolving pie/cake carousel. Sign me up. Breakfast is the one meal I hate to cook. Never can get all the parts done at the same time! Welcome, Geoffrey! I love your phrase "gently-lettered notes," and I have to ask, what are tricky trays? I've never heard that before. Pamela, does Ritters still exist on Baum Blvd.? Kaye, I suspect there aren't as many diners in Southern states because there are so many Waffle House restaurants. What do you think? I think you're right, Kaye. 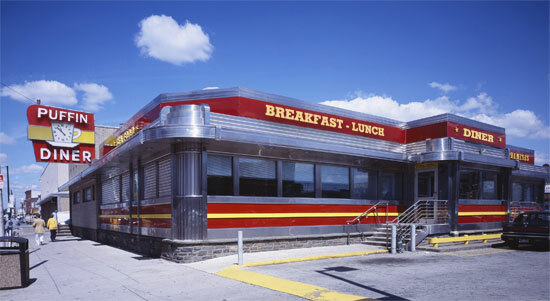 Diners of the classic style never really made it to the south, and the farther west you go, the more likely the diner is to be replaced by the 24-hour franchise places along the interstate: Denny's, IHOP, and that cockroach of breakfast joints, Waffle House. But each town does seem to have one locally owned breakfast joint, where you can get eggs and bacon all day long. In my town it's a joint called Bill Smith's, and you know it's the real deal because a grease fire shuts down the kitchen at least once a year. Time marches on, however, and I'm seeing fewer of the local breakfast joints and more latte-and-bagel coffee shops. The old-style places never serve tofu, and haven't heard of arugula, so the younger folk only go there on a dare. The locally owned coffee shops shun eggs and bacon because--shudder--they have fat and cholesterol, and no self-respecting foodie hipster wants to eat that. My options are narrowing by the day. Still, I have hope. The organic farmers in our area are raising more and more antibiotic-free hogs, and every serious hipster in our historic neighborhood now has a chicken coop in the back yard. Eggs and bacon may break through to a new generation yet! I'm just hoping that, someday, there will be a place in my town where I can get biscuits and gravy after midnight. Rochester is full of Greek diners, all about the same in quality and quantity of grease. I think the best one is the Highland Park Diner, a converted streetcar. However I don't go there often as it is always crowded, always a wait. Being raised by a Texas grandmother, I prefer biscuits with sausage gravy, but if I'm having pancakes and bacon, I always have a fried egg on top and cover it with syrup. Yeah, I know. Back to fruit and steel cut oatmeal. Oh, I love diners - just like my Dad. His morning coffee klatch was at his local diner. Sadly, there aren't many classic diners in AZ so when I am back home my nephews and I have a tradition that the morning I am to fly out, we go to fortify at Yankee Diner on Rte 20 in Charlton, MA. Favorite menu items: the hamburger with mac and cheese ON TOP, the cinnamon raisin french toast, and the bacon pancakes - yes, pancakes with bacon IN THEM. I have made lots of memories in that tiny place with the friendly staff and the fantastic eats! If you're in Portland, OR, don't miss the french toast at Cadillac Grill in E. Portland. Outstanding. We don't eat breakfast out very often, anything we can make at home is usually as good or better than what we get "out", but french toast is an exception, at least at the Cadillac Grill. So Hank, if you don't use syrup, what do you put on your pancakes? Exactly , Gigi! Grease fires. And yes, Geoffrey, what are tricky trays? Jukeboxes--oh, the PRESSURE! You put in your quarter, and pick a song. And then worry how many people will roll their eyes, thinking: she picked THAT? Karen! You know, I never thought about it but yes, Waffle House may very well be the south's "diner." it certainly "feels" like a diner, at least to me. Diners are absolutely the best. Here in Portland, Maine, we have two: the Miss Portland Diner, which serves rather trendy food inside a traditional chrome and steel faux railroad car, and Becky's Dine and Becky's Diner, which is in a regular buildin and Becky's Diner, which is in a regular building, but serves great traditional food as well as keepin and Becky's Diner, which is in a regular building, but serves great traditional food as well as heaping helpin and Becky's Diner, which is in a regular building, but serves great traditional food as well as keeping helping and Becky's Diner, which is in a regular building, but serves great traditional food as well as heaping helpings of Waterfront gossip. Ingrid, yes! I forgot about them. Used to go their for lunch all the time when I worked on Baum and Morewood. I am mortified to admit that after more than twenty years in McKinney, I have never been to Bill's. Shame on me. Gigi, we should plan a visit. I grew up with Denny's, which was the Texas version of the diner before we ever saw iHop. (Or Waffle House, ugh.) In fact, I think I lived in Denny's all the way through college. It was pretty much the only place to eat in my college town (Sherman, TX) AND they stayed open all night. 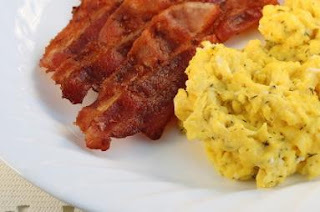 I like my eggs over easy, my bacon and my hash browns crisp, my toast whole wheat, and I love good grits--which apparently people only like if they grow up in the south. Or give me the full English, which any decent British cafe will do. Eggs over easy, English bacon (which is NOT crisp! ), English sausage, grilled tomatoes and mushrooms, toast, and a big steaming pot of tea. And I dare anyone to eat the rest of the day after that. Geoffrey, welcome. I love the story and the watercolor. And I'm fascinated by Edward Hopper. I have a huge Hopper book on my coffee table. Note: don't comment while you're on a conference call, even if people aren't talking to you. Yes, crisp hash browns! Nothing worse than limp, underdone potatoes. There's a sweet diner in Cincinnati called The Echo, been there forever. In my single days it was the thing to do on Saturday mornings, go get breakfast at The Echo. The only way I could get them to cook the potatoes just right was to ask them to burn them. Not that they would ever do such a thing, horrors! But they'd be done perfectly. Thanks for the explanation, Julia. I was wondering if you'd developed a tic or something. And then my first version of this comment was even crazier. Hank — thanks for the question (and hospitality!). I’m a former journalist and PR/Marketing exec who did the landscaping books out of passion for sustainable landscaping and environmental responsibility. Happy to say all three have been best sellers on Amazon. I’ve messed with fiction from time to time, but it finally began to resolve in Stray Cats and the sequel, Nine Lives. This is essentially the tale of a CIA black ops agent who touches bottom, connects with two other discarded spies, unravels an old mystery and a modern conspiracy, and forms a team of troubleshooters who roam the world in a Gulfstream jet (that he stole). Mandy Owens has a cameo on the first book but co-stars in Lives; they save the world as usual, but in the meantime she helps him become whole again. The notion, of course, is a series. Ingrid, Hank — Tricky Trays are a phenomena of this area, primarily as fund raisers for especially churches as well as other non-profit causes. The idea is to get a mess of donated stuff from local merchants, kind of loosely group it in shallow baskets, wrap it in plastic and line them up for ticket purchasers to take a chance. They can get pretty exotic. You can see the stuff on the outside, but the tricky part is what’s hidden underneath. Tickets are usually a dollar or so. 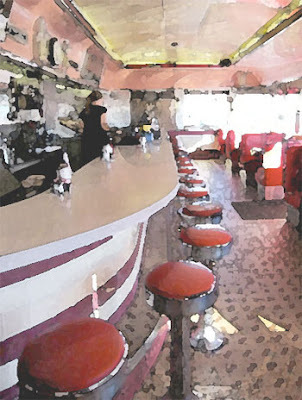 Deborah and others — the diner “watercolor” from the historical society is part of the fun. Sorry, it’s not Edward Hopper. It’s a genuine Photoshop. Anyway, thanks all for a great day of fun — enjoyed the conversation! When I go on a trip, one of the places I seek out first is a great place to eat breakfast, a hole-in-the-wall, a small comfy place where the coffee is the best and the breakfast is just good food. These places are not flashy new designs of hip cuisine. They are part of the community and the lore of comfort eating. They are often well-known, but never try to update to a modern image. In New Orleans during Bouchercon, there was Daisy Duke's across from the Marriott on the side street. The best coffee I had in New Orleans was found there, along with a delicious standard breakfast of eggs, bacon, hash browns, and toast. And, all for that great low price. And, they had great New Orleans jazz art. Kaye Barley and I fell in love with the place and have the pictures to prove it. In Honolulu, my go-to place is Eggs 'N Things, with the Saratoga Rd. location being my favorite (Waikiki). Although for a less tourist filled place, Wailana Coffee House on Ala Moana Blvd. is the true diner eatery. And, those of you going to Left Coast Crime in March, the Wailana is right across the street from the Hilton Hawaiian Village. I won't be attending, as I'm already scheduled to go to Honolulu in April. Oh, and you all have mentioned the diners with the jukeboxes. When I was growing up, there was a diner in downtown Maysville, KY called EATS, but everyone called it Morgan's after the man who ran it. Classic diner, and had jukeboxes on the wall at every table. I didn't eat breakfast there because, well, when and where I grew up, your momma fixed a full breakfast every morning. But, my father had his real estate office downtown, and occasionally, we would eat a supper there. I thought I'd died and gone to heaven with those jukeboxes right at the table, and the roast beef and gravy and mashed potatoes were as good as my mother's, although I'd never have told her that. It is no longer a diner. It is a high end jewelry and art store, but they have kept the big neon EATS sign that hangs over the entrance and the name for sentimental purposes. Geoff, I am so taken with your Tales of the Puffin Diner. It is sure to become a place of comfort to go read. Mandy Owens is someone I definitely want to get to know better. Thanks for visiting the Reds today and giving me a trip down memory lane and a great new reading experience to look forward to. Kathy -- thanks so much for your kind words. The Puffin (as it is called) first appears in Nine Lives; there were several other scenes there that regretfully had to be cut to keep the book a reasonable length. My personal favorite is when Tommy takes Mandy there the first time. She's a protected witness, kidnapped, and rescued from a secret detention center by Tommy, but she has to flee in a shabby disguise. At Tommy's place near Jack's Ford, diner owner Frannie has loaned some spare clothes via Charlie Burke. When they visit the Puffin so Mandy can thank her, Frannie introduces herself and says, "You must be the new girl. I recognize my clothes." Mandy stands to thank her. Frannie motions her to sit. "Honey, nobody stands up for a waitress." Mandy replies: "I do." Which is what Mandy is all about. But the Puffin is small-town Americana, and like all the wonderful diners mentioned here, it's stuffed with memorable characters and stories. As a result, Tales of the Puffin was born and Tommy and Mandy take turns as narrators. As I mentioned to the very patient Hank, there's some backstory on why the characters tell stories in both Diner and Vapor Trail, but bottom line is that it's enormously fun to write! Kathy: I agree that Daisy Duke's in NOLA was an excellent spot for breakfast. For us early birds, they had a great #3.99 breakfast special. I am going to LCC Honolulu, so it's great to know about a nearby breakfast spot like the Wailana Coffee House. I will check it out for sure! Kathy--juke boxes on the tables--sigh. But now there is Alexa, right? Grace, Wailana Coffee House has the most delicious pineapple I've ever tasted. I'd get it to go along with my breakfast. I so wish I could be there with you in March. Hank, I think I prefer the jukeboxes. I haven't been to a diner in ages because of the unhealthy food choices -- but now y'all have made me want to run to one! Waffle House is the only one here, but they have nice, fattening, filling breakfasts. Darn, why are y'all doing this to me? Sue Silva posed a question that seemed to get lost in the crush about writing habits... didn't think it was my place to answer ("all of you! "), but in a nutshell my writing habits are best summarized as "constant" although best in the ayem (5-5:30) until the goal of the day is reached on the WIP. Then I relax by writing the short pieces. If it looks like it might be difficult to get started on the larger work, I do a short piece or two for Vapor Trail just to get into gear. In between, draft edits, tech stuff, the endless task of marketing.